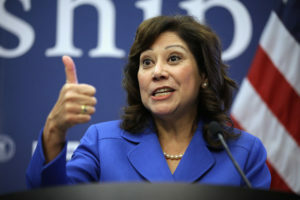 WASHINGTON — Former Obama cabinet secretary of labor, Hilda Solis, has been accused of soliciting money from a fellow government official while in office in 2012. Reuters reported that California Republican representative, Darrell Issa, said he had a tape of a 2012 voicemail of Solis soliciting money from a colleague at work, the latter was not identified. Issa chairs the House Oversight and Government Reform Committee, and has yet to advance his investigation on the IRS targeting scandals due to stonewalling by the likes of ex-IRS official Lois Lerner. In addition, the FBI is investigating Solis for her role at the La Fonda fundraiser for Barack Obama, according to the liberal newspaper Los Angeles Times.